The 1924 Notre Dame Fighting Irish went 10-0, won the first of the school's 11 National Championships, and were coached by the legendary Knute Rockne. But those aren't the reasons they're badass. The '24 Irish featured a backfield of quarterback Harry Stuhldreher, halfbacks Jim Crowley and Don Miller, and fullback Elmer Layden. 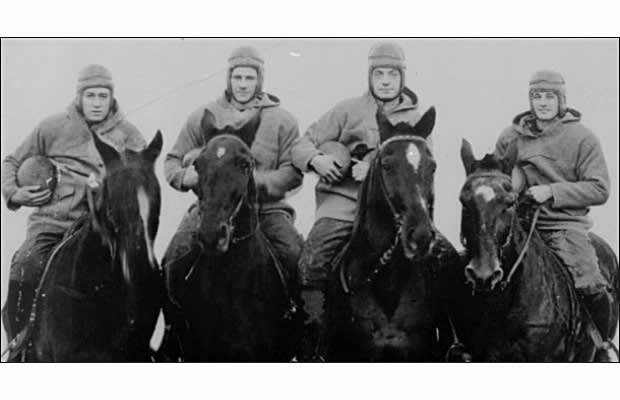 After Notre Dame defeated Army in October 1924, overwrought sportswriter Grantland Rice (as in the overwrought website of the same name) dubbed the quartet "The Four Horsemen." As in "of the Apocalypse." As in "Death, Destruction, Pestilence, and Famine." Undefeated teams and national titlists are a dime a dozen, but carrying one of the top five sports nicknames of all time is badass.